Silver rounds are perhaps the most popular form of silver investment available today. These rounds are coins that have been manufactured by a range of private mints, as opposed to an official coin produced by the United States Mint. Reputable companies can produce beautiful silver bullion rounds with their own unique hallmark stamps, although they are not actually a legal tender. These rounds are actually bullion in the form of coins, instead of the commonly recognized bar or ingot. Rounds are made in a range of sizes and designs. Sizes vary from under an ounce to much larger, although the industry standard is the one-ounce round. One-ounce silver bullion rounds typically contain one full ounce of 99.9% pure silver, with a tiny amount of copper alloy to give the finished product a scratch resistant and durable surface. Another type of round in this category is known as a generic round. These rounds include all silver bullion rounds that have been manufactured in the last three decades by companies that no longer operate. This category of rounds includes those produced by little known refineries that are still in business. 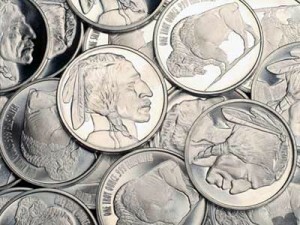 Silver bullion rounds offer many benefits to investors. They typically have a lower premium compared to American Eagles. Because a premium on the product isn’t required, they’re a great way to make a pure silver investment. Silver rounds are also an simple silver investment because they are easy to sell, buy, store, count and stack. They’re ideal way to store large amounts of silver. Silver bullion rounds are also easy to liquidate. It’s no surprise they’re such a popular option for experienced investors, as well as first-time silver buyers. At Oxbridge House, we offer silver bullion rounds that are mint-fresh and beautifully struck. All rounds we sell are 39 mm in diameter with exactly one ounce of .999 fine silver. Each round is hallmark stamped with the exact weight and purity as well.